These are important times. Lines are being drawn, and history will not allow any of us to escape its penchant for creating heroes and goats in times of crisis – even those of us in fast growing Grand Rapids. How can Grand Rapids continue to grow? from MDMTN - modmotion on Vimeo. 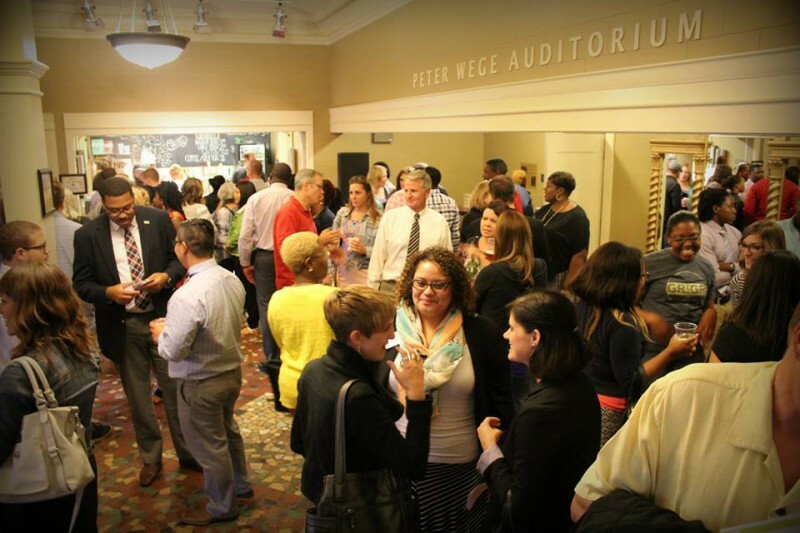 As one of the many leaders involved in Equity Drinks, I was asked to do a follow up to "How We Grow," a conversation held at Wealthy Theatre between people living in neighborhoods in Grand Rapids and community leaders to reflect on lived experience. Specifically, the event highlighted the lived experience of different people within a city that is both seen as trending well economically and yet is a city where non-majority people are not trending well. This conversation was a joint effort spearheaded by Equity Drinks, in conjunction with BL²END, OutPro and the leadership of the Salon. If you missed it, I recommend both viewing the video and at the same time reading through the Twitter hashtag #howgrgrows. I am writing this on Labor Day, a celebration whose disconnection from its roots is near complete in our country. Our society is far removed from the cold January in 1912 when 30,000 mostly white textile workers walked off their jobs demanding better working conditions and pay in the Bread and Roses Strike. To recount that episode is not so different than the actions of Black Lives Matter who has eschewed the false myth of individualism as the antidote to being killed by police and dumped the failed charity and politics of our time in favor of direct action against the destruction of black bodies in their Campaign Zero. The difficulty is that no one can tell you the exact things you need to do in your life to advance equitable growth. Should you support inclusionary zoning? Would gentrification exist if the racial wealth gap closed? Does voting make a difference? Should we focus on poverty alleviation or wealth accumulation? Should I work with or protest against our institutions? The gods have yet to come down and impart a 12 step action plan for people to collectively go from inequity accomplice to equity champion. We all have to evaluate our situation to determine what our steps need to be. So the best way I can navigate that question would be for me share three things I am doing – actions - as a white, straight person to advance equity. One of the biggest realizations I have had as a white person is that the “white person” designation I was handed is an empty identity. For the longest time I readily identified myself as a middle-class white person who had come from a white, middle class background. However, it was only when I interacted with people more steeped in their own cultural identities that I realized how empty “whiteness” really is. Against the vivid values, literature, beliefs, and relationships of friends my whiteness felt like a broken shell on the beach. There is no white food. No white literature. No white beliefs. No white language. It is only a powerful socioeconomic vehicle. If you look back on its history, whiteness is a relatively pernicious line of legislation that served to legitimize slavery and Jim Crow laws by creating a higher level of rights for lighter colored people. And middle class is simply an intricate developmental play book on economics that allows its subject to navigate and prosper in a free market economy (work hard, save your money, you are valuable, you are worthless, nothing is free, etc.). So my very identity, both the white label I apply to myself and the middle-class definition, serves only as a political definition of the highest privilege and then the tools by which I use the assets gained by that privilege. While understanding this history is a helpful political and social context for my situation contrasted to those who are darker skinned, it does not provide me with any real sense of person. Who am I? Who are my people? What was there migration story? What were their struggles? My mother was born in Canada. She spoke French before she spoke English. She, along with her nine brothers and sisters emigrated from Ontario to upstate New York where my grandfather worked on the St. Lawrence Seaway. My family was industrious. They built things. They farmed. They were bilingual. When they weren’t working they were raucous, ambitious partiers. There are hilarious stories of how my drunk uncle ended up chained up all night in the front yard during a reunion or a suitor to my aunt, much to his chagrin, was buried in a pig box as a hazing. These are my people. My hilarious people. This is who I am. My pregnant mother went across the border to Cornwall, Ontario to have me for reasons I can only imagine were nationalistic to Canada. That was a gift as I now have dual-citizenship and my children have that opportunity as well. This identity is important to me. It does not remove me from my status as a white privileged citizen of Grand Rapids, but it gives me a culture and value base to operate from – more powerful than any hollow legislative or economic designation. This allows me to like who I am – which allows me to like other people – and that is important for doing anything positive in the community, including having any real relationships with non-white or non-straight people. Not too long ago I was in a community meeting. At this meeting were several other social sector leaders and we were discussing equity in Grand Rapids. I made a comment about being sick of talking, I want to act, and a friend looked at me and said, “Good, what are you going to do?” That question burned in me. It was an accusation, and I felt angry at it. But when the burning stopped I realized that I vastly under-estimate my influence. The very ugly privilege bestowed on me through centuries of wealth accumulation and institutional preference on the backs of non-white people ironically allows me to do some of the heavy lifting. So I began to ask myself hard questions. Where do we spend our money? With whom do I spend my time? How am I raising our children? Where do they go to school? Do I want to support a religion that has mostly gone silent, or even worse, turned its back on equity? How am I influencing the powerful people around me? When am I silent? Am I being courageous enough in the face of power? Do I rush to be controversial or do I use controversy smartly? Do I have a plan? I realized that I needed to make some changes. I needed to live in the city. I wanted my children to be part of a vibrant diverse city because I believe that is a better life. They are attending Grand Rapids Public Schools. I intentionally sought out different networks. It was surprising to me how easy it is to stay within an all-white, straight network. I rid myself of the idea that meaning is inherent in suffering. Instead, I adopted a material philosophy that says I cannot excuse avoidable suffering. I will not spiritualize the material, physical or emotional loss of a marginalized person. I don’t believe charity is the answer, but that change at a systemic level that places all people powerfully back in control of their own destinies is the vision of community I believe in. I also had to start asking myself the harder questions about power. Specifically, I had to recognize that I am in a position of power and influence. Most straight white people are in a position of power. To deny this is to deny the basic concept of racial disparity. I started organizing and deliberately identifying needs in the community that I could help address. I started to work with others in elevating the racialized history of Grand Rapids, educating to help Grand Rapids understand its future and developing stronger equity networks. I had to have real honest conversations with people in my networks, with people more powerful than me and with my superiors. And I have found that for the most part these conversations were appreciated. I have made friends as a result of these difficult and sometimes scary conversations about where I see room for room for improvement, indifference or inequities. I have found other like-minded people. And I have found people that are not like-minded. It is helpful for me to know where I sit with both. I am under no illusion that well-meaning, individual white persons will be the lone force that equalizes the outcomes for all people as they interact and navigate Grand Rapids. Implicit bias and structural inequities ensure that the work ahead is the work of collective communities. Grand Rapids is not exempt from these powerful, segregating city-building forces as demonstrated by Todd Robinson’s excellent piece on the black freedom struggle in Grand Rapids titled “A City within a City.” We are in this together – tied together in an economic, cultural, demographic and moral conflict. I believe we will have better lives if we solve this together. However, my first caution in immediately focusing on the larger system is understanding it is a large system: you will die before lifting a finger around equity if you wait for a consensus agenda to emerge around housing or education or healthcare or economic development equity. That is not to say it won’t happen. It is only to say that it should not be the only activity that we should be waiting for. 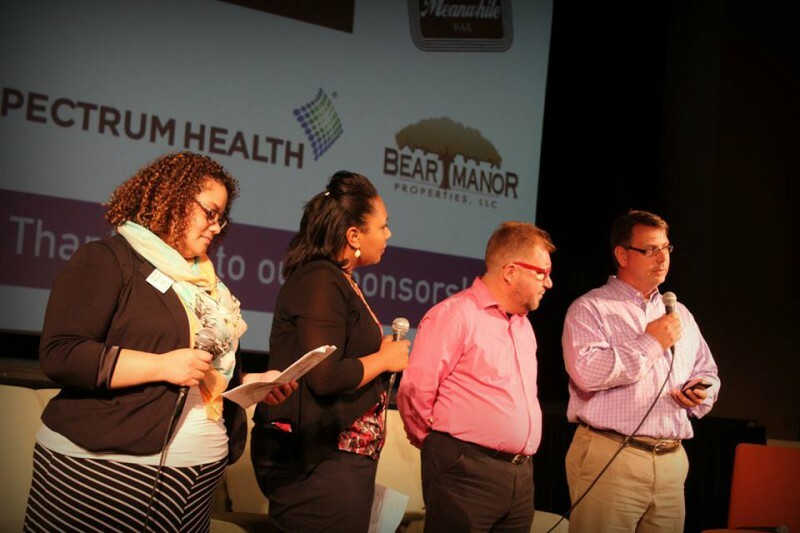 It may also be that the only way a shared equity agenda emerges in Grand Rapids is if many, many individuals and institutions start doing their own work on their own journey and find themselves. I believe this more and more. My second caution – or more of a confusion – is this: there is actually a lot of work taking place in Grand Rapids. From LINC with policing reform and community development without gentrification, Our Kitchen Table with food justice, Project Green focusing on economic empowerment to residents and families, Black Lives Matter with community building and black freedom, The SOURCE with workforce development, Strong Beginnings in healthcare, Grand Rapids Area Black Businesses in black business development, The West Michigan Hispanic Chamber of Commerce in advancement of Hispanic owned businesses, Grand Rapids Chamber of Commerce on targeted talent attraction and LGBT-friendly policy, KConnect on system change in education, DGRI with GRForward downtown transformation plan, West Michigan Environmental Action Council and their environmental justice work, MILegalize on drug policy reform, the Greater Grand Rapids Racial Equity Network building equity leadership capacity and on and on and on. You can randomly throw a rock in this community and hit someone doing the work at a community level. Whether you agree with the many institutions doing work and their approach or not, they are the ones making the space to solve the problems and all of them are thinking about equitable growth. The concern about lots of work taking place with little to show for it is a legitimate criticism. However, if you are not around the table with any of this work you are missing out on influencing it…unless you are starting your own movement. Even then you better be connected with the work taking place and have an articulate and accurate public critique of why you don’t support the work. The group that brought you How We Grow is meeting again to identify specific action items. Over the next few months, the process of identifying specific action items that would advance equity in Grand Rapids will likely play out in the networks involved to bring you this event. So we encourage you to come to the next Equity Drinks or one of the other network events with some ideas in mind of what you are willing to support and how (The next Equity Drinks will take place at LINC on Oct 2 in partnership with First Friday). This work will likely converge with action that is already taking place in the community and focused on building greater support for a focused, high-odds, opportunity agenda. Check out the video responses from people at How We Grow on what they think needs to happen in Grand Rapids to grow so everyone is included. Ask yourself, “What do I think Grand Rapids needs to do to grow so that everyone benefits?” Write it down. Ask yourself, “How can I advance what I think is important to advance equitable growth in Grand Rapids?” Do I know who I am? Am I silent on my values in the presence of family or friends or power? Do I understand the issues our community is facing? Am I using my influence to advance equity in the areas I live and work? Am I connected to work taking place in those areas? Write down your thoughts. Find independent and diverse channels to connect to participate in and discuss your plan. Action and conversation/education is not mutually exclusive, and sometimes our ideas seem like a good idea until we say them out loud to people different then ourselves. Equity Drinks, BL²END, OutPro, the Greater Grand Rapids Racial Equity Network, LINC and Strong Beginnings all have learning/network/event components. Ask yourself, if everyone just at How We Grow alone took these steps and acted upon them vigorously, what would the outcome be?